Contaminomics: sequencing results published prematurely, and later discovered that the major finding is the result of a contamination. DuhOmics: unsurprising results from a genomic study. Usually confirming common knowledge that did not require a genomic study in the first place. Lazarusomics: sequencing the genome of an extinct animal, including hominids, with the implicit or explicit promise that we will be able, very soon, to reverse the extinction. Shockomics: related to advertisomics. Sequencing for shock value and pop publicity. Usually involving human or animal bodily secretions or parts you’d rather not have known about. TooMuchInformationOmics: A result of the personal genomics and microbiome industry. No, I am not interested in that heel spur gene that you got from your grandmother, nor am I interested in the novelty of the chlamydia strain they found in your partner’s microbiome. 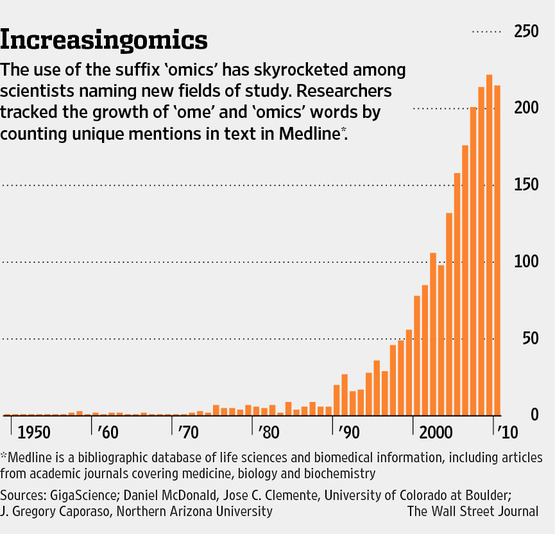 ZZZomics: an omics paper that makes you fall asleep half way through the introduction. Categorized under: Funny, Genomics, Metagenomics. Tagged with: Funny, genomics, microbiome. Don’t forget the “narcissome” or “egome”- researchers characterizing their own ‘omes. Not sure if this tweet will come through in this response- but it’s from Jonathan Eisen.